This is my 23rd installment of Babywearing Stories 365. Each installment features a babywearer in 1 photograph and their answers to 5 questions. My goal is to normalize, promote and celebrate daily Babywearing, moving beyond *what* we use to carry our babies and shifting focus back on *why* and *where* we carry. I hope to share the stories of moms, dads, and babywearing caregivers all over the world. Enjoy! Our baby wearing family: Lucy (mom), Matt (dad), Greta (4 year old on daddy’s back), Eloise (2 year old on mama’s back), Beatrice (6 month old on mama’s front). We are at the Philadelphia airport waiting for the shuttle back to our car after a trip to Florida. While we certainly love the snuggles and emotional benefits from baby wearing, I think for us, baby wearing is just more practical. 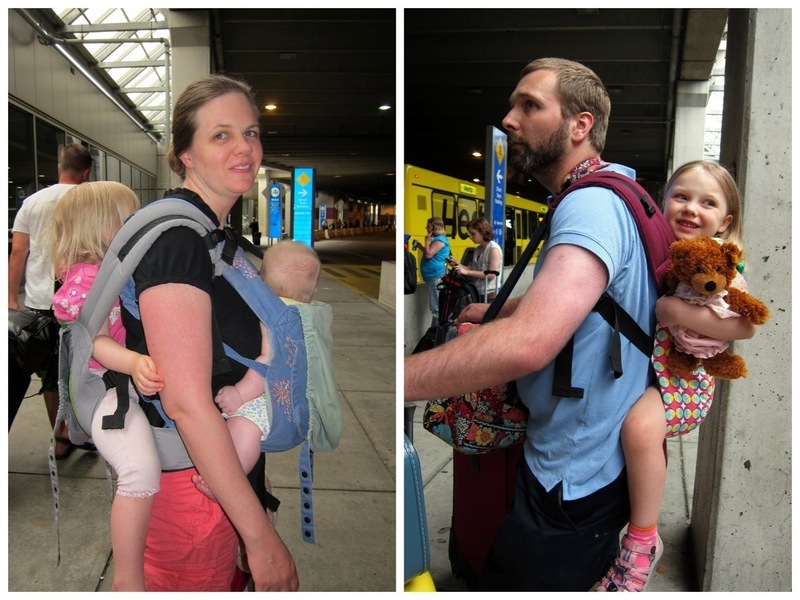 Having all our hands free to be able to pull luggage is much easier than either a) having to hold little hands, who might try to run away or b) having to push a stroller in addition to the luggage. Plus if the baby wants to nurse NOW (as is always the case, right? ), it is easily accessible and we don’t have to stop and sit down! Daily, baby wearing saves me while trying to keep up with the big kids, whether just trying to cross the parking lot and hold two hands or running in to pick up the oldest from preschool. My husband thanks me all the time for finding some way to lug the kids around without having the annoyance of a stroller.